Although it looks like it's straight out of the 1930's, don't bother looking up this one in your aviation history books. The Spacewalker was designed by Jesse Anglin of Hendersonville, North Carolina and first flew in 1986! Despite the fact it is a relatively new design, the Spacewalker manages to capture all the spirit of Aviation's Golden Age. This scale model of Jesse's Spacewalker retains all of the charm of his beautiful homebuilt. Plans for the full-size aircraft were scaled down for the ultimate in scale accuracy. Construction is easy with no glue involved. In the air, Spacewalker is certain to please. Designed from the start to handle any kind of sport aerobatics, it has proven to be one of our most enjoyable models to fly. The big wing, thick airfoil, and long tail moment make for stable approaches and soft, slow landings. But before coming back to earth, it will do enough loops, rolls, snaps, and spins to make any sport pilot happy. Here's a scale model that almost anyone can handle! 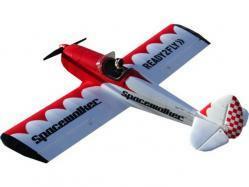 Everything is included in this kit, just add your Lipo Battery, Battery Charger and Radio system to be up and flying!